Mix of salted peanuts, pretzel pieces, caramel malt balls, caramel peanuts and salted peanuts coated in white chocolade with caramel and caramel buttons. BELGIAN CHOCOLATE With sallted caramel chocolate peanuts, malt balls and caramel buttons We've made our nibbles crisp and crunchy, with a careful balance of sweet and savoury. So you can share and enjoy. 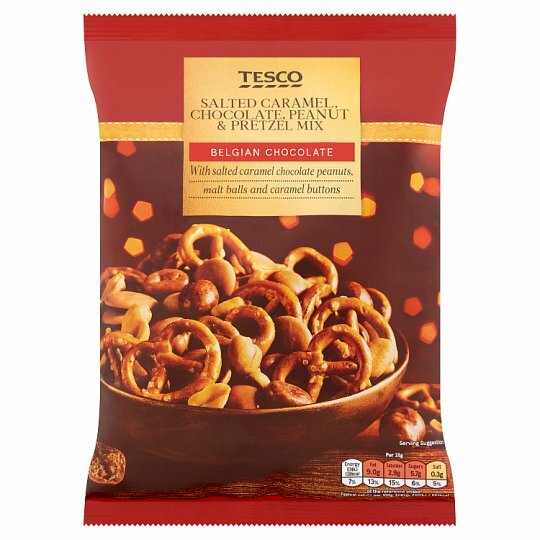 INGREDIENTS: Peanut (38%), White Chocolate with Caramel (37%) [Sugar, Cocoa Butter, Dried Whole Milk, Caramel Powder [Sucrose, Dried Skimmed Milk], Dried Skimmed Milk, Cocoa Mass, Emulsifier (Sunflower Lecithins), Flavouring, Paprika Extract, Salt], Pretzel Pieces (20%) [Wheat Flour, Sunflower Oil, Salt, Acidity Regulator (Sodium Hydroxide), Yeast, Emulsifier (Mono- and Di-Glycerides of Fatty Acids)], Malt Balls (2.0%) [Rice Flour, Malted Wheat, Sugar, Dextrose, Emulsifier (Sunflower Lecithins)], Sunflower Oil, Salt, Dark Chocolate [Cocoa Mass, Sugar, Cocoa Butter, Anhydrous Milk Fat, Emulsifier (Soya Lecithins), Flavouring], Modified Tapioca Starch, Glucose Syrup, Sea Salt, Coconut Oil, Emulsifiers (Acacia Gum, Mono- and Di-Glycerides of Fatty Acids), Glazing Agent (Shellac), Preservative (Sorbic Acid), Acidity Regulator (Citric Acid). May contain sesame seeds.Also, may contain nuts and sesame seeds. For allergens, including cereals containing gluten, see ingredients in bold.